Some 100 Bnei Menashe immigrants landed in Ben Gurion Thursday, where they were welcomed by Interior Minister Silvan Shalom. 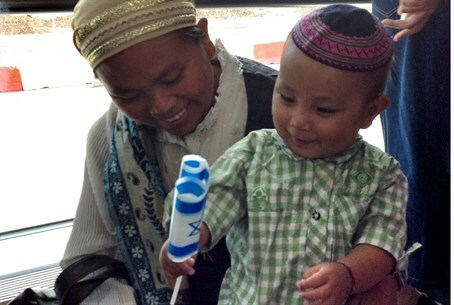 Yet another group of “lost Jews,” the Bnei Menashe, arrived in Israel Thursday morning, marking the third time this month Israel has conducted an airlift of the group's members, who hail from the northeastern Indian state Manipur, which borders Burma and Bangladesh. Some 100 members of the group arrived at Ben Gurion on Thursday, joining 78 others who arrived last week – a group that included the 3,000th Bnei Menashe to come to Israel – as well as another contingent that arrived at the beginning of June, numbering 50. Thursday's group was met personally by Interior Minister Silvan Shalom, who greeted them and hailed their decision to come to Israel. The Bnei Menashe claim descent from the tribe of Menashe (or Manasseh), one of the Ten Lost Tribes of Israel which were exiled by the Assyrian empire after the death of King Solomon more than 2,700 years ago. The immigrants were brought to Israel by Shavei Israel, which received permission from the Israeli government last October to bring 900 Bnei Menashe to the Jewish state by 2015. Currently, there are said to be about 7,000 members of the group remaining in India, many of whom are interested in coming to Israel. “The return of the Lost Tribe of Bnei Menashe to Zion after 2,700 years of exile is a modern-day miracle," said Shavei Israel chairman Michael Freund.